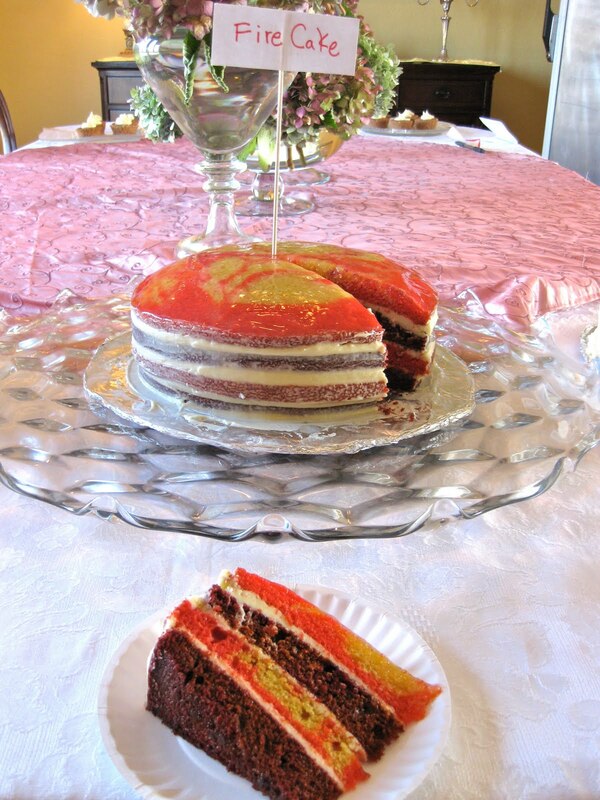 This Rainbow Layer Cake would make a great wizard of oz cake. This is a very cool cake. It's colorful, surprising (to those who don't know what's inside), and bright. 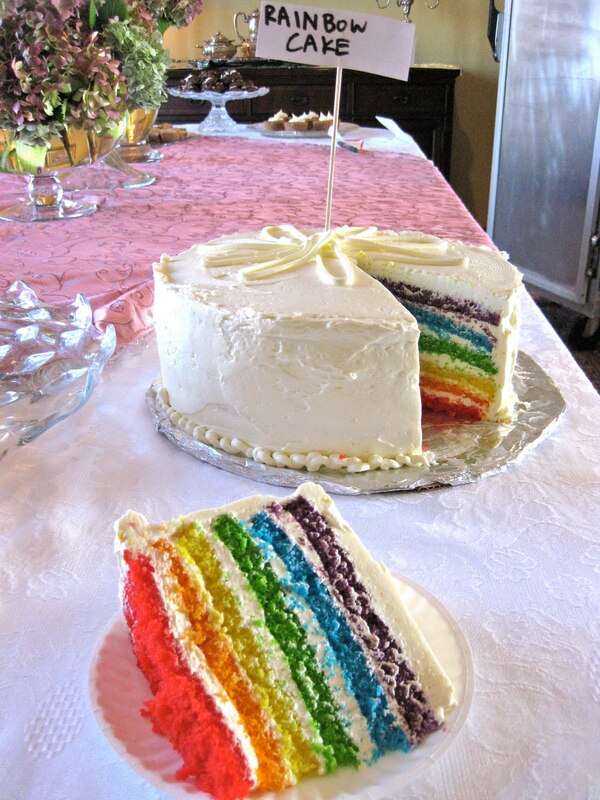 It would make a great birthday cake, wizard of oz cake, or even a rainbow wedding cake. 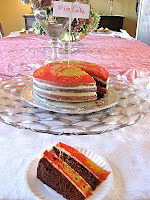 The problem with making a rainbow layer cake is the labor involved: seven layers baked separately. Do you really want to make a cake recipe from scratch on top of that? Some do. Most don't. The ideal cake mix is a pure white mix. Don't use a yellow cake mix. Once you have your cake mix, prepare the batter as described on the box. Divide your batter into 6 or 7 clear plastic cups (depending on how many color layers you want your cake to have) before baking anything. This gives you a quick and easy visual way to check whether you've divided your batter evenly. People get excited when they cut into this colorful cake and are surprised by the rainbow layers that its white exterior belies. To get those bright colors, you need to use professional gel food coloring . These professional gels provide a vibrancy that standard grocery store food coloring just can't offer. Don't use standard store bought liquid food coloring. Add the food coloring directly to those cups and combine it with the batter. Because the cups are clear, it will be easy to see when you've fully mixed in the coloring gel. It also makes cleanup easier and reduces your likelihood of staining things. Few people have seven cake pans. Use seven thin disposable aluminum pie tins to solve this problem and to keep all of your layers uniform. Watch the layers closely. They are thin, so they cook very quickly. And for frosting? Luckily, frosting is another step that you can shortcut. Instead of making a complex frosting from scratch, you can use store bought frosting. Any kind will do: use your personal preferences to guide your choice. To add a hint of exotic flavor to the pre-made frosting, you can mix in a small amount of flavoring extract (almond, lemon, coconut...), about 0.5 to 1.5 teaspoons depending on your taste, and combine well. If you want to see the detailed version for making a rainbow cake completely from scratch, I'd recommend taking a look at Whisk Kid's Super Epic Rainbow Layer Cake Recipe. 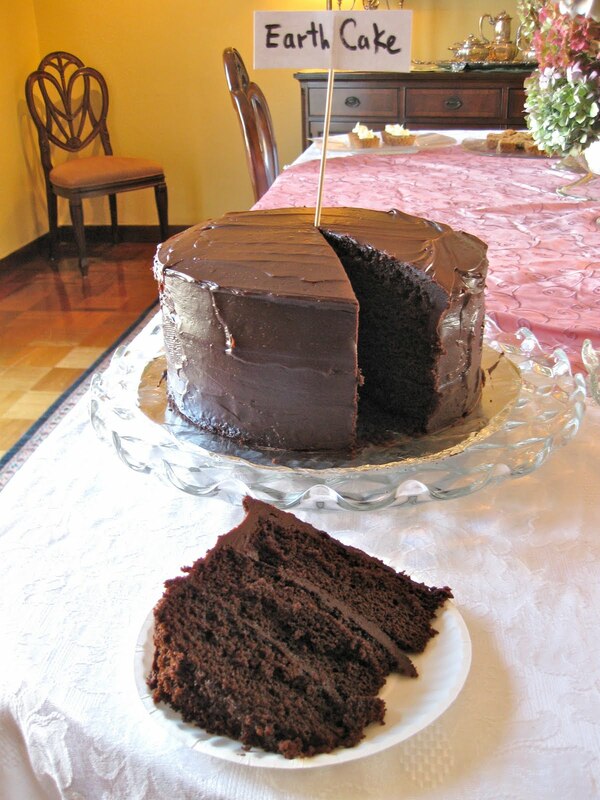 It's an excellent recipe and shows you all the steps involved for making the cake without any shortcuts. Her recipe calls for a lemon flavored meringue buttercream frosting, which I made the first time I made a rainbow layer cake. The frosting is delicious. But, again, it adds more time and effort to a cake recipe that already involves effort beyond the call of duty. I hope you've found my shortcuts above helpful! After drooling over Whisk Kid's Super Epic Rainbow Layer Cake, I decided not only to try it for myself, but to make a fire cake and earth cake so it would have some company. The fire cake was a bit of a challenge. My plan was to make a red velvet cake, but to dye only half of the batter a traditional deep red and to dye the other half deep yellow before marbling the two. 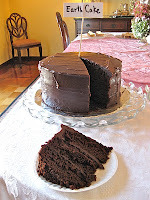 Unfortunately, the cocoa powder called for in the recipe made the batter too dark for the layers to show any marbling. I omitted the cocoa for the next two layers I made, and with good results. I sandwiched the dark "red hot ember" and lighter "fiery orange flame" layers between traditional cream cheese frosting filling, and topped the cake with a clear glaze (the kind normally used for fruit tarts) to show off the surface marbling. 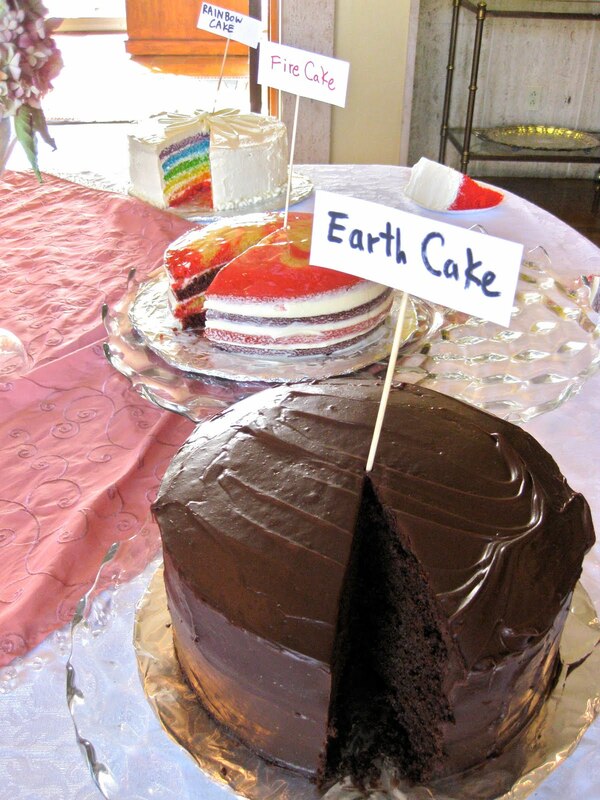 I wish I'd had time to decorate the "Earth Cake," which was no more than a homely triple layer chocolate-espresso cake with a chocolate ganache frosting. A layer of broken up Oreo crumbs or chocolate shards with a gummy worm coming out of the top may not have been super classy, but it would have made the poor chocolate cake feel a little more special. Stunning cakes, and your photos are gorgeous! Is there anyway to get the recipes? Hi Frances! The Rainbow cake recipe and Earth Cake recipe are linked to in the above text. For the red velvet "Fire" cake recipe, any old red velvet cake recipe should work fine, just make sure you only mix half of the batter with red dye, and mix the other half with yellow dye before marble-ing the two. Also, in the red velvet cake, you might want to use a little clear chocolate extract instead of the traditional 3 Tbs cocoa powder, so that your red and yellow colors come through brightly! Hope this helps!